I recently had quinoa for the first time, and to my surprise, I absolutely loved it! So, off to the store I went! Tonight I used red quinoa, and as usual, I had little idea as to what I could and would do with it. 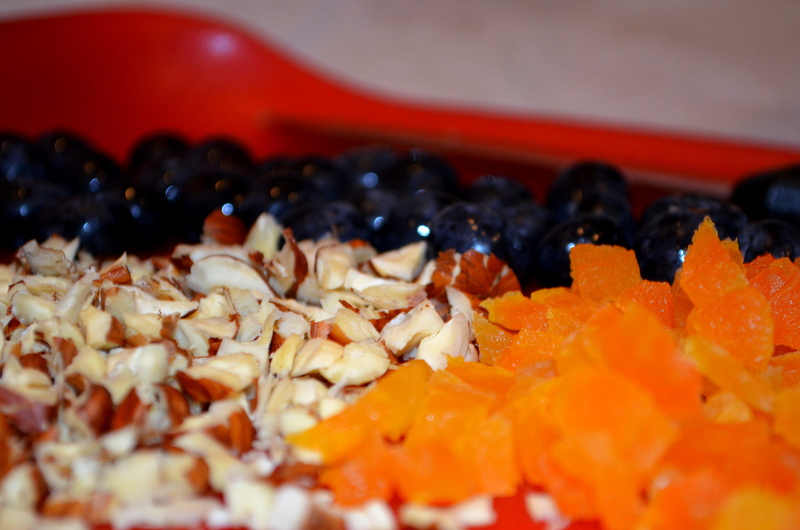 I chose these ingredients: dried apricots, blueberries, hazelnuts, olive oil, curry, cinnamon, black pepper, and rosemary. Again, unusual ingredients, but my gut told me they would work well together. And they did! We really thought the ingredients complimented one another, but my hubby and I both felt like it was a little bland. I didn’t know if I should just keep trying to add more spices (I did this some)…all I knew is that I didn’t want to give up on this dish. So, though I have never heard of someone doing this, I made a blueberry sauce to go over it. I thought, “Why not? 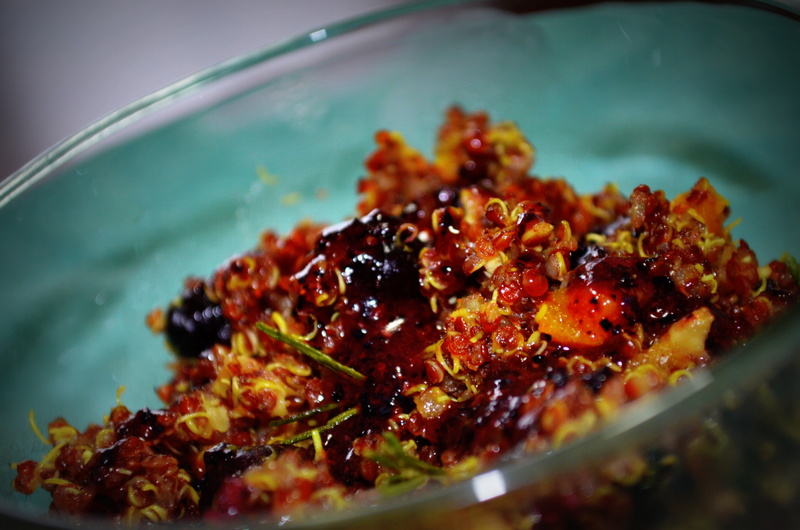 !” The sauce turned out great, and we liked the quinoa much better this way! That said, to be honest, this isn’t a favorite of mine, but I still wanted to share it with you all in case it might turn into a favorite for you. 🙂 If you have any ideas on how I could have made it less bland (besides making a sauce), please suggest away! Chop up the hazelnuts and the dried apricots into small pieces. Measure out the blueberries and set them aside. Put the quinoa in a bowl with cold water covering it. Allow it to sit for 5 minutes. Use a strainer with very small holes to drain the water out of the quinoa. Rinse thoroughly. Put the quinoa in a medium skillet that has a lid…you will want to use it later. Put it on medium-high heat. This is so you can toast the quinoa. Add 2 cups of water, and let it come to a boil. Once it does, turn the heat down to low, put the lid on the pan, and let simmer for 15-20 minutes. Then you will want to use a strainer to drain out the excess water. After you do this, put the drained quinoa back in the skillet. Take it off the stove, cover it with a clean dish towel (it will soak up extra moisture), put the lid back on, and let it sit for 10 minutes. After it has sat for 10 minutes, add in all your other ingredients. Stir thoroughly to get everything mixed in well. Return the skillet to the stove on medium heat, stirring until everything is warm. 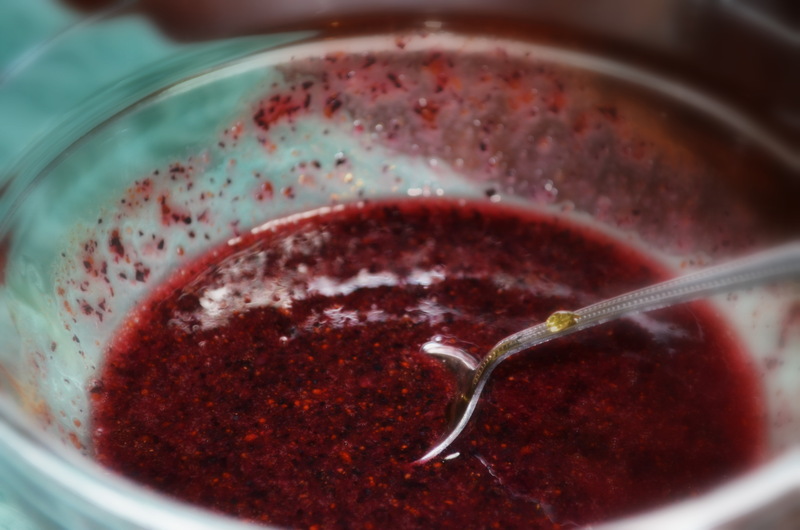 mix the honey and cinnamon in with the pureed blueberries. Oh my gosh, does that look delish! 🙂 yum!! I am so glad it does…thank you! I had no idea how it would turn out when I experimented with it! I didn’t either until recently. It is actually a seed that can be used in place of a grain….so like in place of rice or something like that. Ok – I just have never heard of that!!! Thanks so much Dimple! I so appreciate your sweet and encouraging words! And if you try it, let me know! Love the flavors in this dish, Lori! You’re quite the creative cook! Wow Patty….thanks so much! Huge compliment coming from you!